Their journey to return their original bodies and oppose the plans of the Homunculi and their mysterious Father has led the Elric brothers to Fort Briggs, a stronghold in the North of Amestris that is commanded by the aggressively capable General Olivier Armstrong and her soldiers. 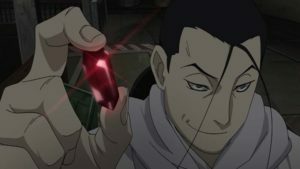 Having just taken care of the Homunculus Sloth and discovered a plot that has been in effect since Amestris’ creation, things get even more complicated when a member of Central’s High Command appears at the fortress with the dangerous Crimson Alchemist Kimblee in tow. 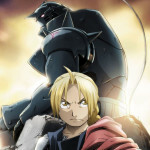 Everyone begins to make their final play in Fullmetal Alchemist Brotherhood Part 2, with the military making their move and the final stages of Father’s plan taking form, Edward and Alphonse find themselves making unexpected allies and risky decisions in an attempt to prevent bloodshed. I was worried that I may have inadvertently written myself into a corner on this review thanks to my article of the first half of Fullmetal Alchemist Brotherhood where I kind of waxed poetical about the entire series. I thought that there might be very little I could actually discuss if I took the same approach with Fullmetal Alchemist Brotherhood Part 2, and that I would just be repeating myself and running in circles. But just as I alluded to in my previous review, for a series whose main story wrapped up in 2010, there’s still a lot that can be said about Fullmetal Alchemist and its Brotherhood incarnation. 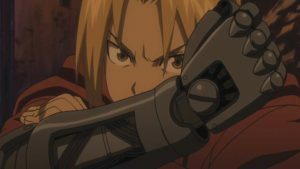 While it’s still the action-laced, quasi fantasy quasi science-fiction mystery with teeth from the first season, Fullmetal Alchemist Brotherhood Part 2 really delves into the political conspiracy aspects of its narrative as mysteries begin to unravel and players make their final moves. 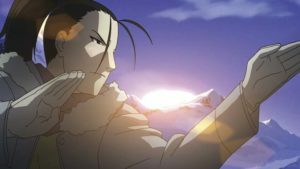 Kimblee is a force to be reckoned as he flaunts his alchemic abilities an authority that has been bestowed upon him by the corrupt military, and General Armstrong and Mustang find themselves entangled in bids for power within Central Command. 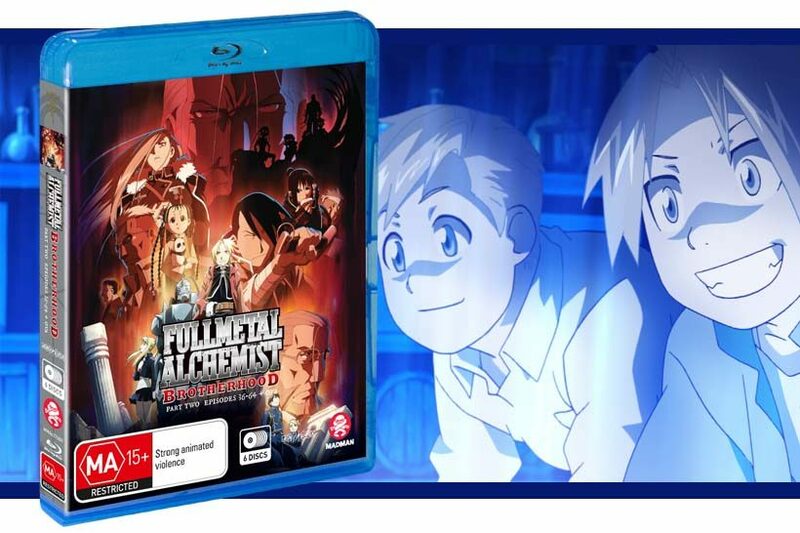 A staple of the series is its balancing act between desperation and determination, and the odds stack against our heroes throughout Fullmetal Alchemist Brotherhood Part 2 as plans come to fruition and mysteries unravel, forcing characters into tricky and sometimes hopeless situations. Another hallmark of the series is that it never embraces hopelessness despite the insurmountable odds. A theme that tends to be present across manga and anime in general is the desire to survive and to keep fighting and never give up. The Fullmetal Alchemist series is perhaps one of the best at actually embodying this theme to its full extent and with such sincerity, as the characters and their desire to live is so strong and the series never forgets its thematic narrative of gain versus sacrifice. The constant reminders of Edward’s dependence on his automail and Alphonse’s condition as a soul bonded to empty armour are part of this, but it is also exemplified by a series filled with characters with strong relationships and how beloved characters who are lost along the way remain in the narrative in people’s memories and become the driving force behind their actions. It also helps that moments of pain and sacrifice are depicted in tense and gripping ways. The episode handling the death of Hughes exemplifies this, but a particular example of this in Fullmetal Alchemist Brotherhood Part 2 is when Edward falls down a mineshaft and is stabbed through the side by a piece of metal. It’s a small moment in the grand scope of things, but the visuals and music really work together to make it impactful. 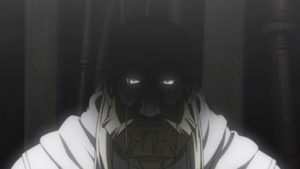 The Homunculi and chimera characters get a lot of attention this season, as Pride steps into the spotlight and multiple chimera characters are introduced to the main cast. While Pride in particular is very active this season and the character I enjoyed the most as a “newcomer,” Envy and Wrath have great moments with the main cast and a lot of character moments that have been building up throughout the series come to a head, especially with Mustang who arguably has the biggest grudge to settle with the both of them. 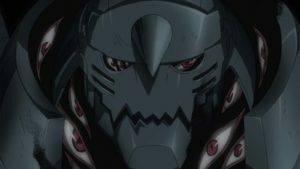 The new chimera characters are also a welcome addition to the show as Edward and Alphonse secure more allies as they are forced to spend some time separated during this half of the series. The show really begins to settle into feeling like an epic when the multiple characters begin making their moves in different factions, with the brothers working alongside Lan Fan, Fu and the chimera, Scar and the Ishvalans making their own preparations, General Armstrong and her soldiers and of course, Mustang and his team. 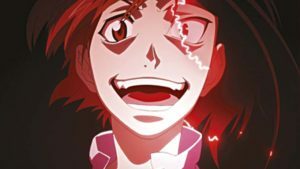 Even characters that haven’t been seen for many episodes return to play apart, and it gives the series a feeling of all things being in their appropriate place. This release of Fullmetal Alchemist Brotherhood contains four OVAs. The episodes are fine, although I personally found the one focusing on Izumi’s training in the North and the one with a young Mustang and Hughes and their experience in the military and fighting in the Ishvalan war were the better of the bunch. I recommend watching them as an interlude during part one and two of this new release of Fullmetal Alchemist Brotherhood, because watching them after the series’ perfect finale felt recessive in some respects. 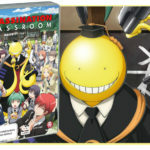 The episode commentaries are also on each disc, a particularly interesting one includes the original voice of Alphonse from the 2003 series discussing a little bit of his experience on the original series as Alphonse and then in Brotherhood playing a new role. However, without a doubt the best extra featured on this release is the compilation of outtakes performed by the English voice cast, which is excellent and hilarious, and I wish more voice acting extras like it were released every day. I was especially partial to the Jeremiah was a bullfrog reference and an absolutely fantastic outtake from the last episode of the series. This is a great series. I am constantly amazed by the sheer amount of attention and love every character in Fullmetal Alchemist Brotherhood gets. Every person has an arc and a purpose, no matter how small or large their part in the overall story is. Each one has a part to play. It’s amazing and speaks to the depths of author Hiromu Arakawa’s narrative power and her ability as a storyteller. I will never not be in awe of her abilities and the grace in which she treats each of her characters and how she sticks to the themes of sacrifice and equivalent exchange without allowing the series to become bogged down by grimdark pointlessness. She is great, the manga is great, and the show is great. The finale feels like all the best finales do, everything falls into place and there is a tangible way forward for the characters to pursue. 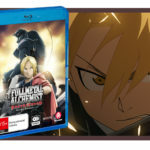 Fullmetal Alchemist Brotherhood is required viewing for all fans of anime and storytelling and deserves several re-watches even for those familiar with series. So stop reading and start watching. It won’t disappoint.